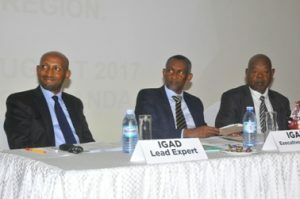 21-08-2017, Entebbe (Uganda): The Intergovernmental Authority on Development (IGAD) kick started the first workshop as part of their National Consultations towards the development of the IGAD Protocol on Free Movement of Persons in the IGAD Region. The Executive Secretary of IGAD; H.E Amb (Eng) MahboubMaliim in his opening remarks emphasized the need for regional cooperation for the vision of the IGAD forefathers to be realized. ‘IGAD has put in place several mechanisms but all our stakeholders at continental level have a role and responsibility towards the success and validation of this great milestone to be achieved’ Amb. Maalim added. Hon. Philemon Mateke, Minister of State for Regional Cooperation at the Ministry of Foreign Affairs of the Government of Uganda officiated the opening and in his remarks gave Uganda commitment towards the establishment of free movement in the region in order to bring that can bring benefits to the region. The main objectives of this meeting are; to gather information on Benefits and Barriers to Free Movement of Persons in IGAD Region; and to generate national recommendations towards the Provisions of the Protocol on Free Movement of Persons in the IGAD Region. The Protocol on Free Movement of Persons is aimed at promoting the regularization of the high volume of informal movement that currently takes place in the IGAD region, and is to increase the opportunities for legal mobility. This National Consultative Workshop is bringing together experts on migration and related themes as well as national stakeholders from each of the Ministries and Authorities of Government, Civil Society Organizations, Academia, Private Sector and Media to contribute to effective migration governance. IGAD received a grant from the European Union Emergency Trust Fund with the intention of facilitating the establishment of a free movement regime within the IGAD region.